Add mockups to Confluence pages. 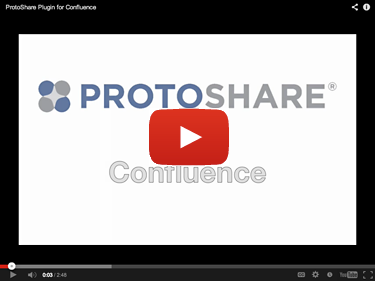 What is ProtoShare Mockups for Confluence? It's not just your designers who are creative. Marketers, salespeople, executives, customer support and developers can communicate much more effectively with interactive mockups. ProtoShare for Confluence makes interactive mockups fast, easy and compelling. Embed interactive mockups and prototypes directly into your Confluence pages! ProtoShare Mockups for Confluence lets you quickly create, edit and view interactive designs (not just static images or sketches) and embed a functioning version of the design directly into your Confluence pages. Why use ProtoShare Mockups for Confluence? Make your point visually in minutes: Quickly create an interactive mockup that is embedded directly in your Confluence page. Create enough fidelity and interactivity so everyone really engages and understands what you're saying (which you can't do with a sketch). Create a Shared Understanding: High fidelity creates engagement. Use ProtoShare's interactive designs to create a shared understanding between UX, Business Analysts, Development and QA. Use the Stencil Library: Use ProtoShare's huge library of pre-built stencils (including Bootstrap, Foundation and more) to create high-fidelity visualizations fast. Or build out your own style-guide of stencils and widgets so that your visualizations match your corporate style. Seamless integration with Confluence: Seamless integration to enhance your existing Confluence workflows. Add interactive prototypes without rebuilding your process. Great for mobile development: Using ProtoShare's iOS, Android and Windows phone stencils and interactive states, create powerful mobile prototypes quickly in Confluence. Platform Support — ProtoShare for Confluence is supported for Confluence 5.1+ on Macs, and on PCs running Windows 7, Vista and XP. Editing designs is supported in Chrome, Firefox (Mac or PC) and Safari 6+ (Mac Only). Viewing designs is supported in Chrome, Safari 5+, Firefox and IE 8+. We follow the basic Confluence pricing model, for an easy and straightforward purchasing process. ProtoShare Mockups for Confluence costs roughly half of what Confluence does. If you have any questions about our licensing and pricing, feel free to contact us.